After our build prep week we were filled with excitement and joy to continue with the process of building Eleidy, Guillermo and their two kids, Elizabeth and Guillermo, a home. This week wasn’t just about building a home it was about building a future and an opportunity for success. Typically, when Live Different staff go through the selection process of finding a family to build a home for, they go though a series of interviews and ask around the community, about who in the community is most in need. In the case of Guillermo and Eleidy it is a little different. In this case a local cement company here in the San Quintin valley came to Live Different and proposed an idea that if they donated all the cement and blocks for the house, Live Different could build a house for one of the workers in need, and that’s just what we did. The cement company asked their staff who was the worker that was most in need/deserving of the home. With guidance from Live Different, the workers came up with Guillermo and his family. The night before build week we sat down with the family at the build site, ate pizza, and shared stories and parts of our lives at home. We all introduced ourselves, shared our age, where we were from, how we paid for the trip and also talked a bit about our families. Guillermo and Eleidy shared their life stories and how they met which was very inspiring for me just to hear. The also shared the struggles they’ve been through and how they have managed to get through it while raising two children at the same time. Build week started at full throttle, within minutes of getting to the build site people started laying brick, and mixing cement while Jordan, Stephanie and I were working away on digging a 8ft hole for the baño (outhouse). This just so happens to be our favorite pastime so if anyone in Canada needs one done, we got you covered. As we started to eat lunch at the work site the wind decided it was the perfect time to pick up, so there was dust and dirt flying everywhere and so we got the privilege of eating half of Mexico along with our lunch. Thankfully, on the following days, a local church opened its doors to us for us to eat inside. 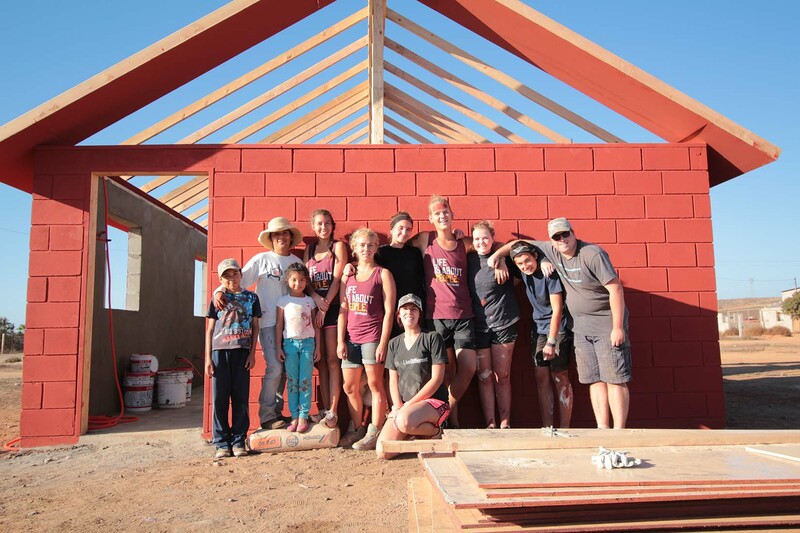 The week continued with us laying brick, finishing the hole, and then once all of the framework was done we began painting the exterior walls and building the roof. This is where it got real for me. Like, wow… we were building a house! All of the building was so new to me since I have never been on a build trip before let alone done copious amounts of manual labour. I am practically the laziest person on planet earth and my bed is my best friend, but I have learned to do so much and feel like I have even grown personally in this experience. As Friday approached, we were finishing up interior work like electrical, walls, putting in windows, putting up the fence, getting plants… and then painting and dry walling the ceilings. Overall this week was such a wonderful experience being able to work alongside the family to help build their home. By giving them this new space there is hope for a better future where they do not need to worry about having a roof over their head, but have a spot for their kids to thrive and for the family to continue to contribute to the community.